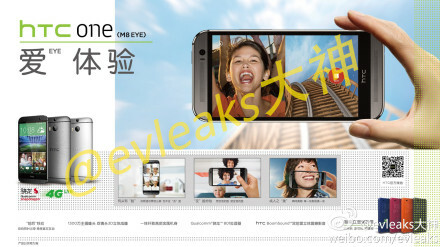 The other day we heard abut the HTC One M8 Eye, a version of the HTC One M8 with a 13MP dual camera. It was speculated that the phone may be announced at HTC’s New York press event on the 8th October, and it seems we don’t have that long to wait to see the thing thanks to these leaks. Posted on evleaks’s Weibo page, this image is supposedly of the upcoming phone. Unsurprisingly it looks just like an ordinary HTC One M8, with the context of the images presented implying that it’s all about photography. Sadly the resolution is incredibly poor, so we can’t try and figure out what it says. That all relies on the shot being legitimate, which it may well not be. As much as we would like it to be real, it’s also very possible that someone just whipped this up in Photoshop based on the information we have already. According to rumours the phone will be the same as the One M8, with the only difference being that the camera will have 13MP of resolution and OIS, presumably omitting HTC’s Ultrapixel technology.